Someone e-mailed (or is it a spam?) me this morning about this new product form Acer. Though at first, I hesitated to open the e-mail, I decided to have a look since I was kind of bored waiting for someone for a scheduled weekly discussion. Hmm… What can you expect from a Malaysian when it comes to punctuality? 😀 Then again, this piece is not about the said discussion or common attitude of Malaysians. After reading the e-mail, I decided post an article about the product. I know I’m not that tech-savvy-guy type but I’m pretty sure I can write something about this Acer Aspire P3 Ultrabook. Alternatively, you can skip to Acer website to see its product HERE. 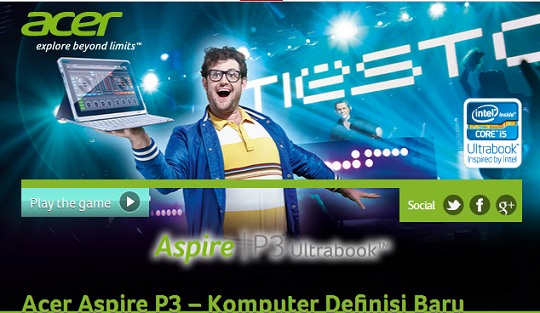 OK, the main attraction of Acer Aspire P3 Ultrabook must be its ‘Free Virtual DJ Acer Edition’ that allows you to test your DJ skills and perhaps give you an idea whether you can be the next Faizal Ismail or Farra Fauzana. That’s their key marketing strategy for this notebook, I think. You can check out the Free Virtual DJ Acer Edition software HERE. You can actually download it and install it on your notebook/laptop even it is not an Acer! Nonetheless, there are many other soft wares that can perform the same function as Virtual DJ such as MixVibes VFX. Well, you probably know what to do next. One thing about Acer that I like is they always come up with nice designs and colour schemes. I know there are probably many other notebooks that look like this but I still consider Acer Aspire P3 Ultrabook as a beautiful thing. I might consider it for my daughter if she does well in her exam end of the year. Ha ha.. That might get her pumped up and prepare extra hard! See the pictures below. Credit to Acer website. The Acer Aspire P3 Ultrabook is super thin and light. It weighs about 0.79kg (without keyboard) and is about 9.95 mm – 10.15 mm thick. A careful look at this product, you can say that it is actually a laptop that doesn’t come with a keyboard. You’d think that would make it a tablet, but the Ultrabook logo on the top right corner of the bezel says you’re wrong – the bundled keyboard case lets you turn it into a proper notebook when it’s time to get to work. The keyboard, which uses Chiclet-style keys, is a little cramped and there’s no room for a touchpad – however, you shouldn’t need one as the screen supports 10 point multi-touch. The price tag for Acer Aspire P3 Ultrabook has been set at RM1,999 for the Core i3 model while the Pentium-based unit is priced at RM 1,799. If want the more powerful version, you can choose the Intel Core i5 version of Aspire P3 which also comes with 4GB worth of RAM. The Core i5 is priced at RM2,299. For more info on Acer Aspire P3 Ultrabook, check out the Acer Website today. Acer nya design memang terbaik tapi dari segi kualiti sepanjang menggunakan produk acer ni agak kurang. memang sangat teruja sangat tengok iklan Acer Aspire P3 Ultrabook ni.